Machines and their safety components may only be placed on the European market if they comply with the fundamental safety and health requirements of the EU machinery directive (MD) 2006/42/EC (PDF, 1,3 MB). As a rule, the manufacturer can carry out the conformity assessment of his product on his own responsibility before declaring its conformity with the Directive. Depending upon the circumstances, the involvement of a notified body carrying out a EC type-examination may be required for the declaration of conformity for machinery and safety components listed in Annex IV of the Machinery Directive. The IFA is notified by the European Commission for carrying out EC type-examinations and registered under the ID number 0121. The testing and certification body of the IFA also exchanges experiences with the notified test bodies responsible for machinery in Europe, and it provides its testing experience in European and global standard-setting negotiations. 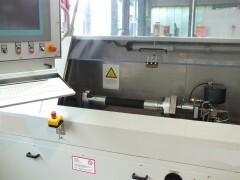 Generally, the manufacturer can commission a notified test body with a type test of his product at any time. For products not listed in Annex IV, he receives a type-examination certificate confirming conformity with the Machinery Directive once the tests have been passed and further requirements have been met. In such a test, numerous material, design, and function tests are conducted at the IFA laboratories in order to study individual compliance to the directive. For the machinery or safety components stated in Annex IV for which harmonized standards are not observed or do not exist, either an EC type-examination must be conducted or the full quality assurance procedure described in Annex X must be followed. Both options require the involvement of a notified body. If the product stated in Annex IV is manufactured in accordance with harmonized standards, the Machinery Directive further makes provision for the conformity assessment procedure described in Annex VIII with internal checks on manufacture by the manufacturer himself. After successful EC type-examination, the manufacturer receives an EC type-examination certificate. Type-examination certificates are limited to five years and serve as the basis for the manufacturer's declaration of conformity. The manufacturer is obliged to notify the notified body immediately of any changes to the respective products. The competence of the IFA test body derives from the authorization issued by the ZLS (the Federal States' Central Office for Safety Technology) and the accreditations certified by the DAkkS, Germany's national accreditation body.